It’s interesting how life can gently provide us with daily reminders. The types of reminders I’m thinking about are the ones that serve to bring us back into the present moment, and find us looking at something familiar with new eyes. I found my mind pausing (just for a moment perhaps) as I pondered this rather straight forward instruction. Sure, there was the obvious message here…watch where you walk, so that you don’t end up tripping on or getting your foot caught in the gap between platform and train! But that wasn’t why I had suddenly paused. These 3 words had gotten me to actually pause and breathe in the midst of a familiar crowded commute. It would be inaccurate to say that my pause encouraged my fellow commuters to pause. In fact, my stopping for a moment caused a few annoyed people to jostle me in an attempt to (I can only imagine) walk through me. Their actions were predictable, however in that moment, my reaction to their behavior was different. My own reaction changed. Instead of pushing back, I let myself melt into the flow of passengers into the train. I might have even managed to smile at a face of two as I took up temporary residence in a corner of the train. To me this quote points to one of the foundations of mindful living. We cannot control the behavior, feelings, or reactions of anyone else. However, we always have at least a split second between their action and our reaction. That small amount of time is the space between “stimulus and response” that Frankl refers to. I often talk about this idea with my therapy clients, and remind myself daily of the same thing. We frequently feel propelled by years of social and emotional conditioning to continue in the same familiar patterns and ways of responding to people and situations. Perhaps our patterns are so embedded that we are not even aware of the element of choice in any given moment. In terms of art making, think of it this way. When you begin a painting (staring at a blank canvas) there are countless possibilities available. You can choose any brush in your collection, any color of paint, any type of mark making, any theme, style, technique. In each interaction you have with that surface and the materials, you are making an actual choice. When we are deeply engaged in the process, we might not be aware that we are constantly making choices because we are so immersed in the process. However, we are making choices every moment of the day. 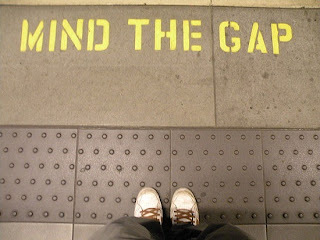 Why not harness this creative power, and try to imbue our days with a little more consciousness as we “mind the gap”?